Wrap your child in true love, with the beautiful manchester and accessories ranges from US-founded Aden + Anais. Established by Raegan Moya-Jones after her move from Australia to the United States, Aden + Anais was invented by way of necessity. Within the US, Raegan simply could not find the swaddles and wraps that Australian motherhood tradition cherishes so dearly – so she started making her own. The results are the darling swaddles and bedding you see before you. Designed to be worn over your baby’s pyjamas to eliminate the need for loose sheets, the Slumber Sleeping Bag assures a peaceful night’s sleep. Each sleeping bag is also made from 100% cotton muslin, for a plethora of benefits: the fabric is breathable and prevents overheating, and also grows softer the more it’s washed. Slumber Sleeping Bags are fitted to be just the right size for your baby’s growing body, and are adorned in prints that you’ll just love. They’re perhaps the best way for your baby to enjoy a safe and peaceful sleep. Suitable for infants aged 6 to 12 months. 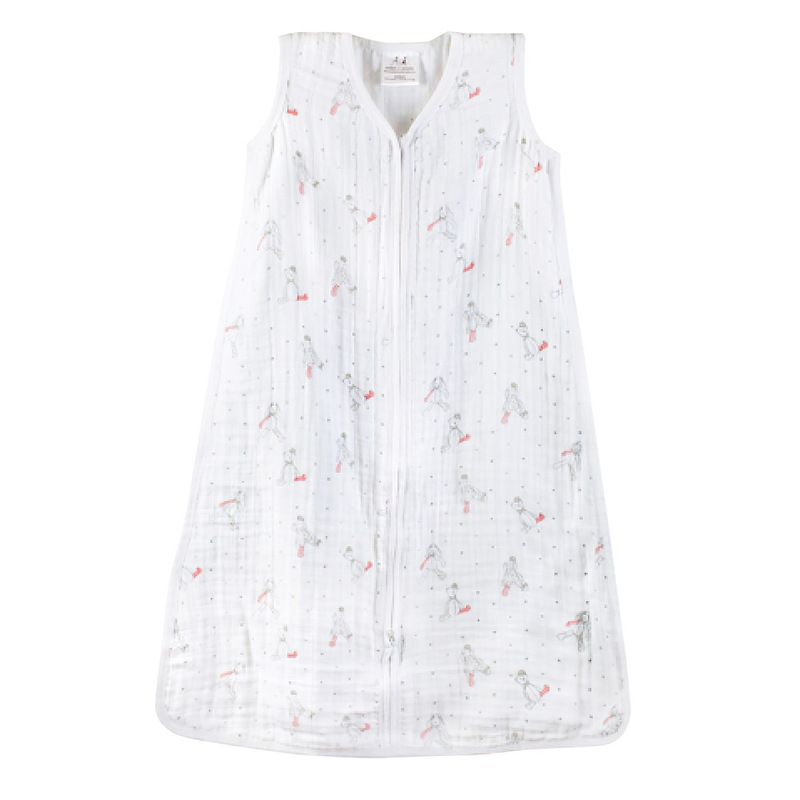 Made from 100% cotton muslin. Breathable fabric helps prevent overheating. Fitted to be just the right size for your baby's growing body. Replaces loose blankets for a safer sleep. Zips from the bottom for easier night-time changes. The more you wash your sleeping bag, the softer it will get. Cold machine wash and low tumble dry recommended. Size: Medium (6 - 12 months; 58 - 71cm; 7 - 11kg).